Hummingbird specialization and vulnerability are often predicted based on physical traits. Scientists have now found that this is not the case for hummingbirds on the Caribbean islands. Instead, the bird's environment is the determining factor. The new study was led by scientists from Center for Macroecology, Evolution and Climate, University of Copenhagen, and published today in the scientific journal Proceedings of the Royal Society B.
Hummingbird's body size and bill length are often used to predict how specialized and vulnerable the birds are to extinction of the flowers they feed on. However, a new study shows that vulnerability and specialisation of Caribbean hummingbirds are determined by their environment. The study is published in Proceedings of the Royal Society B. 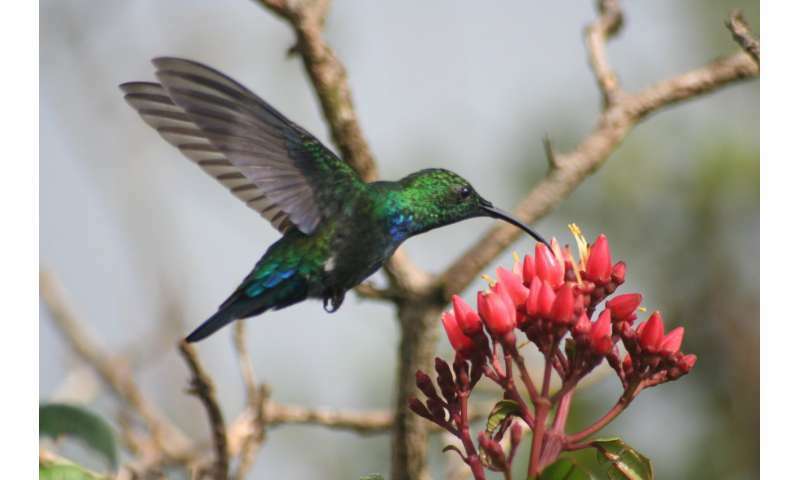 Associate Professor Bo Dalsgaard from Center for Macroecology, Evolution and Climate says, "Our study shows that Caribbean hummingbirds living in rainy mountainous landscapes with cooler temperatures are more specialized and vulnerable to extinction of the flowers they drink nectar from, compared to hummingbirds in the lowlands. We believe our results display a general trend that applies to many other animals and plants throughout the world. Thus, protecting nature in mountain regions is very important, if we want to conserve specialized and vulnerable species, which exist in just one or a few places on Earth." There are around 340 hummingbird species in the world, all native to the Americas. Of those, 14 live on the Caribbean islands and only the Rufous-breasted Hermit (Glaucis hirsutus) is also found on the American mainland. In general, birds on islands are more vulnerable to extinction—during the past 400 years, 90 percent of known bird extinctions have happened on islands. 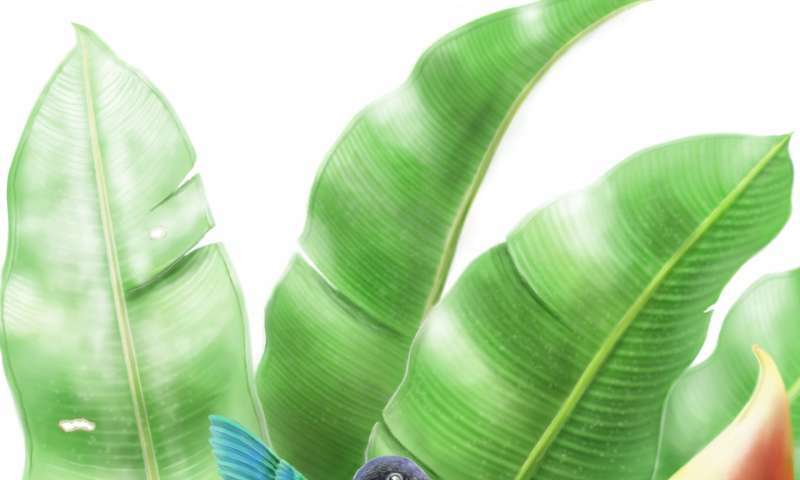 Hummingbirds on the Caribbean islands most likely developed their characteristic body sizes and bill lengths before they came to inhabit the islands from the American mainland 5-9 million years ago. Postdoc Jonathan Kennedy from Center for Macroecology, Evolution and Climate, says, "We found that Caribbean hummingbirds have likely evolved their physical traits before colonising the Caribbean, and not in co-existence with their flowers, which is the common trend often assumed on the American mainland. How these relationships develop over long timescales is important in order to better understand how vulnerable the birds are if the flowers they feed on become extinct." Many species rely upon interactions with others in a mutual way, such as hummingbirds who drink nectar from flowers, while at the same time pollinating the flowers they visits. Thus, this study provides important knowledge on the predictability of extinction risk through the study of networks of interactions among groups of species. "Our results can help predict the extinction risk of species, which are mutually dependent on each other, like hummingbirds and their flowers. This has become especially important as climate change and human activity disrupt these delicate partnerships, and cause extinctions of not just birds and plants, but many other species throughout the world," Associate Professor Bo Dalsgaard concludes. Climate change: can hummingbirds take the heat?